The district of Madhubani was carved out of the old Darbhanga district in the year 1972 as a result of reorganisation of the districts in the State. This was formerly the northern subdivision of Darbhanga district. It consists of 21 Development Blocks. Bounded on the north by a hill region of Nepal and extending to the border of its parent district Darbhanga in the south, Sitamarhi in the west and Supaul in the east, Madhubani fairly represents the centre of the territory once known as Mithila and the district has maintained a distinct individuality of its own. is practiced in the Mithila region of India and Nepal. Painting is done with fingers, twigs, brushes, nib-pens, and matchsticks, using natural dyes and pigments, and is characterized by eye-catching geometrical patterns. There is ritual content for particular occasions, such as birth or marriage, and festivals, such as Holi, Surya Shasti, Kali Puja, Upanayana, Durga Puja. Madhubani painting/Mithila painting was traditionally created by the women of various communities in Mithila region of India and Nepal. It is originated from Madhubani district of Mithila region of Bihar, and , it is popularly called Mithila painting or Madhubani painting. Madhubani is also a major export centre of these paintings. 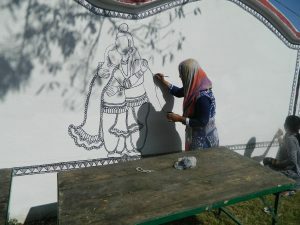 This painting as a form of wall art was practiced widely throughout the region; the more recent development of painting on paper and canvas mainly originated among the villages around Madhubani, and it is these latter developments led to the name Madhubani art being used alongside the name “Mithila Painting. Kapileshwar Temple is situated in the Rahika region of Madhubani District, Bihar, India.. 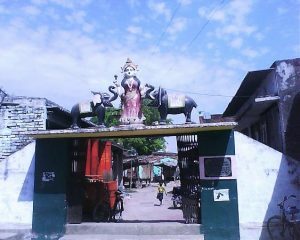 The village is noted for its Shiva Temple, also known as Kapileswarsthan. Numerous devotees congregate at the temple every Monday and particularly in the month of Shravan. A large fair is also held on the occasion of Maha Shiva Ratri. A Shiva Linga was placed at this temple by a Kapila sage. This is one of the famous shiva temple in Madhubani District. It has a big pond outside the temple people from there take water for shivlinga. It is surrounded by villages like Kharaua, Rampur and Jagat. In the month of Shrawan people from different part of Bihar comes for Jalabhishek of shivlinga. The temple has a big boundary and in the centre of it Lord Shiva temple is situated whereas there are another temple also inside the boundary of it like Parwati temple, Hanuman Temple etc. There are many sculpture here is from history.